At coconut point you have to walk over sharp rocks to jump off for the paddle. Clean A-frame breaks. 9 days in Sri Lanka felt like a dream. Cliche, I know. Who knew a quick 3.5 hour direct flight from Bangkok could transport you totally elsewhere. I often times forget how textured Asia can be culturally. And totally accessible with flights way shorter than my usual NY <> CA stint. The original intention was to head south to Bali. Turns out Bali is farther and more expensive and doesn't have great waves in January. Sri Lanka randomly popped onto the radar while looking at where to best surf the Indian Ocean this time of the year. The idea of overrun Bali compared to a sleepy fishing village south of Sri Lanka made it an easy choice. After all, my trips are usually measured by the number of animals walking on dirt roads in relations to hotel chains. More cows less Sheraton! With a back pack and no plans other than surfing I took the road straight to Hangtime Hostel in Weligama. Think I found them on Google Maps or Instagram or something totally random. A bunch of Aussie friends from Gold Coast decided to go all in and open their very first hostel. With just one month under the belt they nailed the vibe. Some little things still need ironing out (like towel hire, more trash bins and recycling, etc). The place feels like walking into your new friends' house. We were sitting in a roadside stall. Over macaroni kottu, Lambro, Molly, Liam and I chatted over whether I should make an attempt to go to the mountains. They had just arrived Weligama from the mountains and loved it. "2016 is the year of simplifying. Do less. Get deeper. Take your time." said Lambro (mouthful of food). "At least that's what I'm doing..." Liam added "if you think you are going to be sitting on the bus wishing you were surfing then you should just stay." Taking time became my little project for the 9 days. If anything 2015 was the year where time ran away in a big way. I already clocked 20 cities across 8 countries, with 4 new countries last year. Work was beyond overflow. Then there was selling the house, and moving. I then manage to run off from Bangkok immediately after the family situation. Here I am sitting on this beautiful beach wondering where else to go. It's like being stuck in this perpetual state of looking at the next thing. I ended up staying here the entire time, foregoing any ambition to wander the country. I decided to slow down. Do less. Each day is limited to two activities max. Morning surf sesh, breakfast, stroll somewhere, nap, some afternoon thing (surf again or other stuff), dinner, hang out, reading time, sleep. 9 full days of nothing but this. It really took a while before I got comfortable with it enough to begin to experience the little things I would not have otherwise experience had I just rushed in and out. Eventually I left my phone behind, sending only the daily Instagram report. I stopped reading news feed, work email, etc. I was present. I took time to get to know the people around me. Stick fishing can be spotted along the coastline. These guys are actually fishing, unlike some of the spots closer to more touristy areas where they just sit and pose. I caught 5 sardines - far better than the attempt in the Amazon. Sri Lanka isn't a place where a newbie solo traveler should come. Especially if you are a woman. Everywhere you go people harass you. I've got everything from a van driving on the opposite side of the road stopping traffic to van-stalk me just to have a chat. To the weird dude that followed me for 10 minutes at night wanting to buy me beer and go for a smoke on the beach. Then there was the tuk tuk stalker who would pop up in front of my hostel randomly. On average 80% of the men you walk by cat calls you in some capacity whether they are walking, biking, tuk-tuking, or driving. Even the airport bag security guy hit on me in the 30 seconds I stood there. Coming from NYC I have been trained to ignore the world well when it comes to this subject matter, but my god this place is by far the worst among everywhere I have been to in the world. This isn't to brag. Every women I've spoken to had this happen to them. Some have gone so far as to buy a cheap wedding band to put on to throw it into the men's face. Then there's the insane amount of ripping tourists off. It's really in your face and really bad. When I travel I know that I will likely pay more. In a way I'm supporting a much poorer economy. To the extent that it is reasonable I don't usually mind. Not in Sri Lanka. Take a taxi ride for example. The ride from Colombo to Weligama cost me 12,000 rupees. The ride from Weligama back to Colombo cost me 8,000 rupees *but* the driver himself only got 3000 of that amount. The 5000 is considered "finders fee". Then they wanted to shove another person in the car to make extra 5000 rupees. So, really, how much does the driver actually make versus everyone else who just walk around being earth's dead weight. That said it really is quite economical to travel here. The flight from BKK was ~$320. Probably cheaper had I not bought it last minute. Hostel ran ~$8 per night. Surfboard ~$2 per hour. You could rent a scooter for ~$8 per day. A local meal in the market with fresh fruit juice and desert runs you about ~$5 (tourist price). For the 9 days I spent less than $1000 total. That includes renting a tuk tuk and getting great Ayurvedic treatments. Taking time also has another meaning here. Plan to wait forever for everything. You want a mango juice? 1 hour. You want dinner? Let me bike to the market and come back to cook you one. You want to check in to your flight? Wait 50 minutes. No one ever tracks time when I rent out my surfboard. The notion of time is very loose here. Plan for forever and be pleasantly surprise when something come thru. 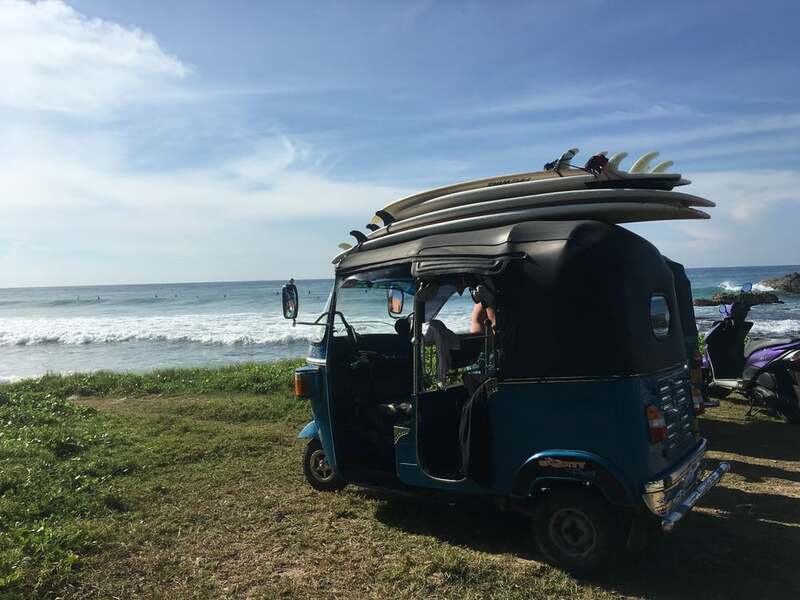 Crash course surf tuk tuk driving is exactly as terrifyingly adventurous as it sounds. When you take all the noise that is humanity out and look into the horizon of that vast blue water, everything simply just..melts..away. The ocean envelopes you. The water's warm. The surfing was so so good. Rode with really great crew. Loads of different breaks that lets you hone your skills as well as put blood on your face. I rode a few 6-7ft'ers this trip. Learned how to ride the line left and right. Got a few hang-fives in. Paddled out really far to a point break. My first extraordinary intimidating point break. Some sets were definitely double overhead. I came away with a busted jaw, popped elbow, bloody gash on the left leg, eye infection, and a fat lip. Sign of a trip well done. I'm reading this book Barbarian Days. Kinda feel like am living it. Local Sri Lankan surfers whistles out to the ocean to call for waves. Just by listening in you know if one is coming. Such a much needed reward from all the chaos that was 2015. I feel really good about 2016.